Your enemy is the blank page. When it comes to writing, there's no wrong way to get words on paper. But it's not always easy to make the ink flow. Paper Hearts: Some Writing Advice won't make writing any simpler, but it may help spark your imagination and get your hands back on the keyboard.Practical Advice Meets Real ExperienceWith information that takes you from common mistakes in grammar to detailed charts on story structure, Paper Hearts describes:• How to Develop Character, Plot, and World• What Common Advice You Should Ignore• What Advice Actually Helps• How to Develop a Novel• The Basics of Grammar, Style, and Tone • Four Practical Methods of Charting Story Structure• How to Get Critiques and Revise Your Novel• How to Deal with Failure• And much more! This book was everything I needed and I am so glad that I was able to be a part of this blog tour. As someone who is trying to write a book, one can never get enough advice. And I know I have probably heard this advice countless times but reading sparked something new in me. 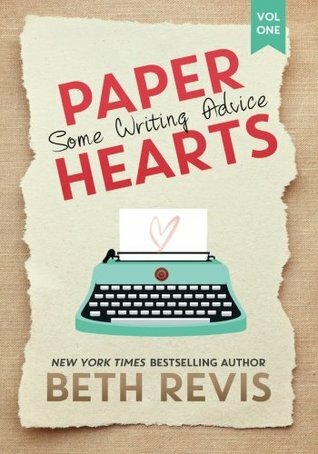 Beth Revis has this way with telling advice that makes her seem relate able. Her writing makes it sound that almost anyone can write and that if you have a dream to publish a book or have a passion to just write and let your words go. This isn't a long review but I think the best thing you can do is to read this book for yourself. If you are an aspiring writer who wants to one day possibly publish something read this book. Beth Revis tells you her advice and she is not here for everyone to follow her advice. There are many ways to write a book but you will never know if you do not try. It seems like a cute read!